When you’re using the desktop view in Windows 8 things won’t feel all that much different than they do in Windows 7. Something I thought Microsoft might change in Windows 8 was the size of the thumbnails displayed when you hover over running apps in the Taskbar, but unfortunately they are just as small as they always were. Luckily you can change that just like you could in Windows 7 by using a third party app. The one that I would recommend this time around is Taskbar Thumbnails Tuner. 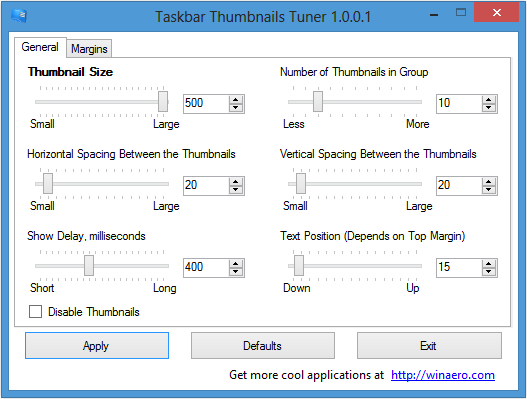 This free app gives you all kinds of control over the Taskbar thumbnails including the size, margins, spacing, delay, and more. You can even use it to disable the thumbnails all together if you don’t like using them. Change take effect immediately without needing to reboot your machine. I’ve always been a big fan of increasing the size of the thumbnails so that I’m able to see more clearly what each window contains. If you, for example, have multiple instances of Windows Explorer open it can help immensely to be able to see the contents of each window before switching to it. There is one downside to increasing the thumbnail size though. The larger you make the thumbnails the further your mouse will have to travel to select the one you want to switch to. So you’ll probably want to keep that in mind as you determine the right size for your needs. Initially I started with them as large as I could make them, but eventually lowered it down so that they ended up being about 50% larger than what the default is.